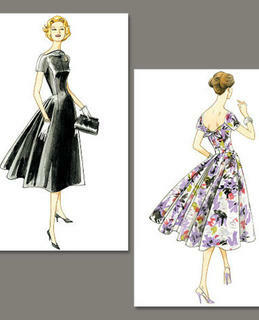 Calf length dress has semi-fitted, pleated and lapped bodice, bias skirt with inseam pockets and stitched hems. Designed for two way stretch knits. MISSES' DRESS: Close-fitting, flared dress with side front seams and darts, raised front neckline, low back with darts, waistline seam, tie, skirt with side back seams and inverted pleat, side zipper closing. A: short sleeves. B: long sleeves with snap closing. Below mid-calf length. MISSES' DRESS: Below mid-knee dress has close-fitting, self-lined, sleeveless bodice with back tie ends to hold bodice in place, flared skirt, raised waistline and back zipper. 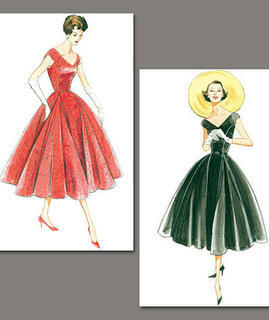 Below mid-calf length, sleeveless dresses A, B have close-fitting V-neck bodice with princess seams and extended shoulders, flared skirt with godets, side zipper and inside belt. Self-fabric or purchased belt. Purchased petticoat. Tom & Linda Platt dress. Fitted, above mid-knee, pullover, lined dress, bias cut, has gathered forward shoulder at left side with bow and knot. Right side has drop shoulder. MISSES' DRESS: Loose-fitting, pullover dresses A, B have hem facing. A: Center front cut on crosswise grain. Fabric Two-way Stretch Knits Only This pattern is a "Today's Fit" please use this sizing chart when choosing you size as it may differ from your normal one. Chado Ralph Rucci Dress & Belt. Close-fitting, lined to edge dress has shoulder darts, side front pockets, inside ties, hook and eye closure. Tom & Linda Platt close-fitting, lined dress has decorative shoulder and side darts, lingerie straps and invisible back zipper. Kay Unger Dress. Close-fitting, lined dress has extended shoulders, pleated left side bodice front with two-piece pleated bow, and invisible back zipper. No provisions provided for above waist adjustments. FABRICS: Jacquard, Shantung, Satin Back Crepe. Loose-fitting, pullover dress (cut on crosswise grain of fabric) has bias self binding for neck and armholes, side drape and stitched hem. A: side pockets with casing and contrast drawstring. Kay Unger Dress: Fitted, lined dress has bias, pleated middle front, pleated lower front (right side), and back vent/zipper with self tab. 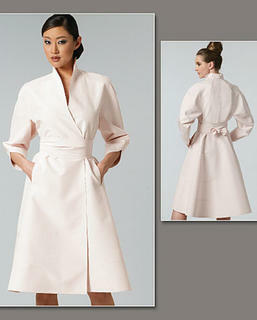 FABRICS: Lightweight Gabardine, Shantung, Lightweight Crepe. 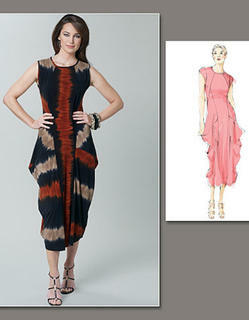 Pullover dress has close-fitting, self-lined bodice, raised waist, seamed skirt, stitched hem, and invisible side zipper. FABRICS: Lightweight Denim, Lightweight Gabardine, Lightweight Linen. Contrast B: Lightweight Wool Jersey, Lightweight Double Knit. 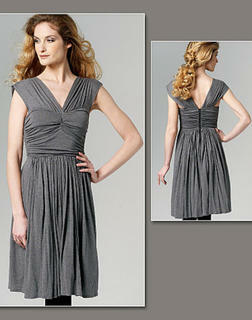 Pullover, close-fitting, lined dress has draped sides and narrow hem. FABRICS: For Moderate Stretch Knits: Lt.wt. Jersey, Matte Jersey, Sheer Knits. Lining: Stretch Mesh, Tricot. Dress has low neckline slit, close-fitting bodice cut-in-one with sleeves (slit), side back bodice extending into uderarm gusset, lined midriff, single-layer tie ends (wrongside shows), skirt with side front/side back seams, side front pockets/vents, invisible back zipper, stitched hems, and self-bias binding. Topstitching and edgestitching. FABRICS: Synthetic Suede, Lightweight Double Knit. MISSES'/MISSES' PETITE DRESS: Lined dress has bias, pleated, twisted upper front bodice, semi-fitted bodice, front pleated skirt, invisible back zipper and vent. FABRICS: Crepe, Linen Blends, Tropical Wool. MISSES' DRESS: Close-fitting, lined dress (fitted through hips) has yokes, right front with pleats, back princess seams, and invisible zipper. FABRICS: Crepe, Ponte Knit, Shantung. Very loose-fitting, pullover dress has neckband, seam detail, side slits and hem band. A: armhole bands. FABRICS:For Single Knit with Body: Double Knits, Stretch Wovens with Good Crosswise Stretch. Also for Contrast 2 B: Stretch Mesh. Pullover dress (cut on crosswise grain) has very loose-fitting, slightly blouson bodice, shoulder/front waist and skirt side pleats, elastic seamed waist, stitched hems, thread loops, and self-lined belt. FABRICS: Two-way Stretch Knits: Rayon/Spandex, Cotton/Spandex. Pullover, partially bias dress has very loose-fitting, lined bodice pleated into self-lined yokes, elastic (seamed) waist, pleated skirt right front (wrong side shows), french seams, back-button, loop, slit closing and side loops for purchased belt. Finish with bias self facings. FABRICS: Crepe de Chine, Charmeuse, Matte Jersey. Lining: Tricot. Pullover, mock wrap, lined dress has shoulder pleats, loose-fitting bodice, elasticized, seamed waist, front overlay (wrong side shows), bias armhole bands, and very narrow hem. FABRICS: Crepe de Chine, Charmeuse and Voile. Lining: Chiffon and China Silk. MISSES'/MISSES' PETITE DRESS: Lined dress has yoke fronts extending into sleeves, close-fitting bodice with side back seams, raised waist, semi-fitted skirt, side front extends to lower side back, no side seams, mock front bands, and concealed snap closing. MISSES'/MISSES' PETITE DRESS: Lined dress has front neckline pleats, close-fitting bodice (slightly above waist), pleated skirt, thread loops, and invisible back zipper. Hem is topstitched in place by hand. Purchased belt. FABRICS: Poplin, Silk Dupioni, Lightweight Linen. Unsuitable for obvious diagonals. MISSES' DRESS: Close-fitting, lined dress has front godet, seam detail and invisible back zipper. FABRICS: For Moderate Stretch Knits: Ponte Knit, Wool and Cotton Knit. Lining: Tricot. MISSES' DRESS: Fitted, lined dress has front pleated collar, side front seams, bias left front band, left side front pleats, gathered center back, and invisible back zipper. FABRICS: Lightweight Crepe, Crepe Back Satin, Jersey. Lining: Tricot.